The cornea is the clear tissue made up of several layers that is located in front of the iris (colored portion of the eye). A fluid (aqueous humor) space called the anterior chamber separates the cornea from the iris. 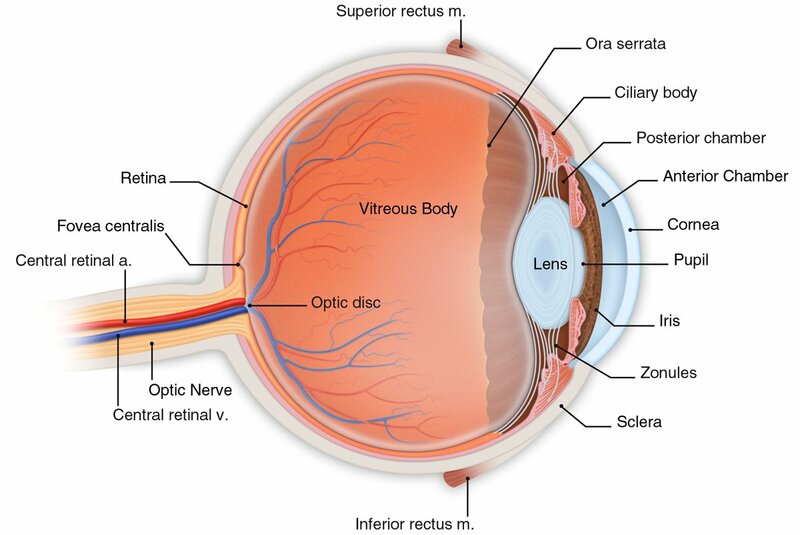 The cornea helps the eye focus images onto the retina. It must be smooth and have a symmetrical contour in order to focus light clearly. How do Foreign Bodies Occur? Many times at work a person may have a foreign body fly onto the surface of the cornea. This is usually metal from grinding on metal or working under a metal structure and the metal gets stuck on the surface of the cornea. Today workers have to wear protective eye shields when working in an environment where a cornea foreign body could occur. This has diminished the number of corneal foreign bodies. Many foreign bodies occur at home either by landscape people or homeowners working in their yards. These foreign bodies are usually plant material. Also homeowners who are do-it-yourself people or have hobbies commonly have foreign bodies from working on cars or wood working. Someone who believes that they have something in their eye need to be seen immediately. Many people wait to see if it will work its way out on its own. This almost never happens. The sooner the foreign body is removed decreases the complications related to corneal foreign bodies. The length of time the foreign body stays on the cornea increases the chance of infection, scarring, and loss of vision. The typical metal that gets in people’s eyes contains rust and very quickly begins to rust into the corneal tissue. Therefore, it is important to be seen early as the rust needs to be removed as well as the foreign body. There is also a risk of infection as there may be bacteria on the metal which can cause an infection or ulcer around the foreign body. The issue with plant material foreign bodies is that they typically have bacteria or fungi and the cornea can become infected quickly. In many cases, there will be a scar on the cornea from the foreign body especially if it is on the cornea for a period of time. If the foreign body happens to land on the cornea in the central cornea in the pupil area, it may cause a permanent loss of vision if the scar is significant. A corneal ulcer or infection can cause damage to the cornea and increase the size of the scar. Immediate removal of the foreign body is vitally important. This is done after instilling a topical anesthetic drop. If the foreign body is metal, the rust ring needs to be removed as well. This is usually accomplished with a motorized burr to clean out the rust. The patient is placed on topical antibiotic drops and the dosage will depend on whether an ulcer or infection is present. If you believe that you have a foreign body in your eye, seek immediate attention. Either go to the emergency room or call your eye doctor. Early treatment decreases the risk of scarring, infection and loss of vision.